South Korea and five Central American countries have initialed their free trade agreement, which is expected to pave wider ways for Asia's fourth-largest economy to tap deeply into the continent, the trade ministry here said Sunday. In November of last year, South Korea and six Central American nations -- Nicaragua, El Salvador, Honduras, Costa Rica, Panama and Guatemala -- struck the FTA deal, 1 1/2 years after the two parties launched official negotiations in June 2015. But Guatemala has not initialed the deal, as the country delayed its participation in the free trade deal due to unresolved domestic issues, according to the Ministry of Trade, Industry and Energy. Under the deal, they agreed to eliminate tariffs on about 95 percent of goods made from each country within 10 years after the pact takes effect. The countries will officially sign it in the first half of the year. After signing, the free trade agreement will be submitted to the countries' respective legislatures for approval before it can be implemented. 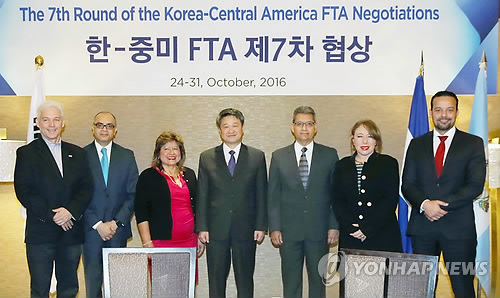 The ministry said the Korea-Central America FTA is the first trade accord that the region, which has seven FTAs, including one with the United States, has concluded with an Asian country. Trade volume between South Korea and the six nations totaled $4 billion last year, accounting for about 0.4 percent of the country's total trade volume. South Korea has a number of FTAs with major economic blocs, including the U.S. and the European Union, and FTAs with the South American countries of Chile, Peru and Colombia. Meanwhile, South Korea is also seeking to launch trade talks with the South American trade block MERCOSUR in the first half of this year.